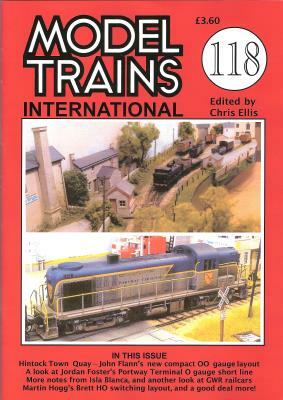 To give you a feel for the subjects that Model Trains International covers in each issue, we've added a few sample articles from the magazine to the website. These have been taken from issues no longer available - on the one hand it's a way of sharing articles with you that you couldn't get otherwise. On the other, it doesn't reduce our potential income! "On the Nebenbahn" is editor Chris Ellis's exploration of German branchlines as potential subjects for a layout while "Budget Modelling Starts Here!" has suggestions on getting into railway modelling on the proverbial shoestring. Finally, "Oldbury Basin" is Jordan Foster's minimum space N-scale layout and is very typical of the type of layouts featured in the magazine. If you are a complete beginner wanting to go ’scale’ straight away, or if you wish for a nice low budget approach to the hobby, take a look at the Athearn range for a combination of excellent quality and performance with very modest prices. Of course, they are American which might not suit you if you have a preference for the glorious age of steam or some other country’s rail operations. But on the other hand the prices are low enough even for sampling purposes to see how you like the idea of American modelling. Athearn are just about the lowest priced models around from a main manufacturer and this is due to their ‘no frills’ approach - no glossy catalogues, no lavish adverts - and long, long production runs in America of well-proven designs Because the quality is so good they have, in the process, become the benchmark by which all others are judged as far as the American market goes. This is how Athearn (and similar kits) come, all parts pre-coloured and ready for easy assembly. If you have never made any sort of kit before, let alone a railway kit, you could not go far wrong with one of Athearn’s freight car kits. The sample shown is the standard 40ft PS-1 box car, perhaps the most typical of all items of American freight stock. This box car, made by Pullman Standard to AAR requirements, was used by virtually all rail operators in America, and was built in thousands in the 1940s, 1950s and up to the early 1960s. Today only a few are left in revenue earning service, though others are in service stock, because the 50ft box car has usurped the old 40 footers as the common type. Any in service in the past twenty years would have had their roof walks removed and end ladders cut down to about half height, which is a change you would need to do if your layout is set in the last twenty years or so. Before that, roofwalks were the norm, as furnished on the model. The Athearn kit comes in many company finishes, that shown being the attractive Great Northern style of around 1958-60, though a 1948 build date is marked. Top: It’s best to assemble the underframe components upside down and fit couplers - here Kadee No 5 magnetics - before screwing in the trucks. The body doors are slid on to the runners. Above: The completed model, in Great Northern Railway light blue. First thing that may surprise you is the price - under £31 for a fully painted set of parts. If you buy it in the USA it might be a third cheaper again, but you can’t really complain about the UK price either! Open the box and you find a body, floor, ballast strip that fits under the floor, two sliding doors, an underframe, and a bag containing two bogies (called ‘trucks’ in American jargon), two screws, and two couplers and draft box covers. The exploded diagram shows you it is just a simple assembly job from then on and it will take you about fifteen minutes at steady careful pace and 30 minutes if you really dawdle! The chassis is best assembled upside down. Floor, ballast weight, and trucks are fitted in that order. It is best and easiest to fit the couplers before you fit the trucks. Then when the trucks are secured with the screws the whole lot is held together. Slide the doors into their runners, glue in the brake wheel, and snap the body over the underframe. Paint the brake wheel in body colour, or the nearest match you have, and that’s it. Takes little longer than it takes to read about it! You may need to remove a little ‘flash’ from the floor moulding using a craft knife. An important word here, though, for beginners. The model comes with horn-hook couplers, a good enough functional coupler which works quite well. But you can do better, even as a beginner, by going straight to the unsurpassed Kadee magnetic coupler system which is used by most American modellers. The wonderful Kadee coupler closely resembles the real thing and works remotely and ‘hands off’ over a magnet in the track. It’s like magic and once you’ve tried it you’ll be satisfied with nothing else. Get the Kadee No 5 pack, which gives two pairs, and you’ll find it adds a little over one pound a model to your costs. But that will still give you a super smooth rolling, perfectly finished box car for around £4*. Compare that with British 00 rolling stock prices. If you use the Kadee No 5, omit the horn-hook coupler and, instead, drop into each draft box on the upside-down frame, the metal spring plate from the Kadee pack. Then position the coupler itself over the centre spigot in the box. Hold it in place with tweezers while you simply clip the coupler draft box cover plate (from the kit) in position as shown in the coupler and kit instructions. Flick the coupler with your finger and it should displace either side and spring back to the centre. If it flops to one side it is incorrectly located; disassemble the draft box and try again. As a beginner, either in the hobby itself, or in American modelling, you will probably be delighted with the result, whether you make a box car or any of the other Athearn freight cars in this price range. Next move for a beginner to American modelling will be a locomotive, and Athearn can fill the bill again. You would be best, if a beginner, going for one of the swltchers - SW9, SW1500, Baldwin S12, or a GP38-2, the jack-of-all trades locomotive. These models are in the £20-£26 price range1, with metal chassis and twin flywheel drive to give a super responsive and totally reliable performance. However, as the EMD GP60 is the latest Athearn loco release, we’ll deal with that. The work required on Athearn locomotives is similar for all. The body comes on the chassis, but all the other bits have to be assembled by you from the bag of parts supplied. These include light glasses, horns, suspension dampers, handrails, and other odd fittings depending on the model. If you are short of references just assemble the model as it comes for you can always return to it later for extra detailing. However, in real life nearly all companies had distinctive detail differences in such matters as light, horn, and bell placing, sun shades, and even exhausts. If you find any references magazine illustrations or even an article like this - about the loco you are modelling, all well and good. You can check out the details and add them accordingly. Quite apart from any detailing you may need to do, all Athearn models need the handrails to be assembled from the components. These are pre-shaped handrails with slide-on and push-in stanchions. Superglue will keep everything in place. The Kadee No 5 magnetic coupler will go straight into the Athearn draft box, just as described for the box car. One No 5 Kadee pack gives you two pairs of couplers, sufficient for both models featured here. Drilling out the dimples for the grabrail positions. Glazing is inserted in the number boxes. Drill out (with pin-drill, Minidrill, or hot pin) the locating holes for the grabrails on the rear hood. Another pair locate on the short hood top and on the right side of the short hood. Moulded dimples indicate the hole positions. For the Southern Pacific loco modelled, cut off the rearmost of the two filler caps on top of the short hood. Also shave away the centre hinge from the locker below the cab windows, left side. The Detail Associates grabrails are now in place and the number box moulding is filed flush. Insert the grab rails. If you want to do it the easy way get Detail Associates pack SY2202 (from Victors or Sharp) and you have pre-formed items that just drop into the holes. For greater economy you can get a pack of Bambl wire office staples and cut and bend them to size with small pliers. Secure each grabrall with a touch of Superglue. Fit the horn cluster on the roof. Then add an air conditioning box (12mm x 12mm X 2mm) on the cab roof. Then add a junction box (5mm x 5mm x 1mm) to the left rear of the air conditioner. Then glue a strip to indicate a conduit running to the front edge of the cab roof. Use scrap plastic or thick plastic card for these items. From more scrap plastic or thick plastic card add a base for the orange warning beacon, to the left of the horn cluster. After painting is complete you can fit an orange beacon here from the Roco or Herpa road vehicle accessory packs. Or you can file up a beacon from scrap. Cut two sun shades from plastic card strip and glue above each side window. From Bambl staplers cut dummy screen wipers and secure these with a touch of Uhu or Loctite clear giue to the front and rear cab windows. Assemble the side and end rails, and the suspenslon units, from the parts supplied and as shown on Athearn’s exploded assembly diagram. The sections of the handrails adjacent to the end steps should be painted white. All the rest are dark grey to match the body colour. The one error on the Athearn model that needs correcting is the depth of the side sills. They should be only as deep as the centre segments above the belly tanks. Trying to carve away the lower edges of the sill would be difficult to do well. So we used the wartime camouflage trick and ‘blanked’ out the wrong depth using strips of black lining transfer along each lower edge so that the white strip on each side was uniform in depth with the centre segments of the sill. This is a cheat, but quite an effective one. There may be other ways of doing it, but none as simple as this! Paint out the centre of the front sill stripe. If you have some small white figure decals, you can repeat the loco number here. Paint chassis and trucks dark grey. Add two marker lights, resembling older car lamps, on the front edge of the forward verandah, again working from scrap. A snow plough is optional, but common. The foregoing gives you a correctly detailed GP60 of SP. Pictures actually show a few extra small panels of stencillIng on the sides. If you have the Microscale Southern Pacific decal sheets you’ll find these little warning notices there. Actually this model requires more work than most. Even other GP60s may differ. The Norfolk Southern GP60s would not need the roof additions. The horn cluster would relocate ahead of the cooling fans on the body top, and two ‘fire-cracker’ aerials would be needed on the roof. Apart from correcting sill depth and adding a small bell below the sill, left side aft of the cab, the NS model is fine as it comes.